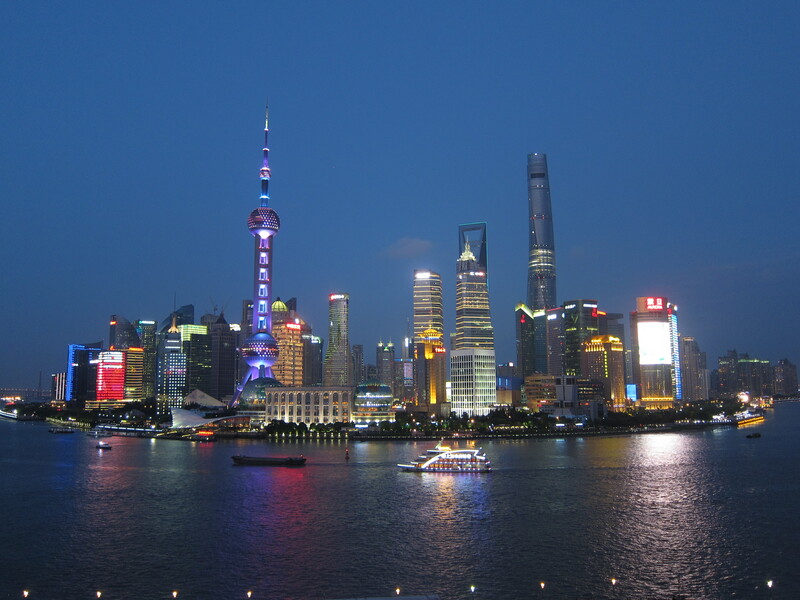 Greetings from Shanghai, one of the most modern and liberal cities in China. It has been a few years since I was here last, but it still feels so familiar. There are of course a few new (and higher) sky scrapers in the sky-line, as every time I return, but the people, smells and overall ambiance is the same. Also, the internet connections are ever so poor as they used to be. 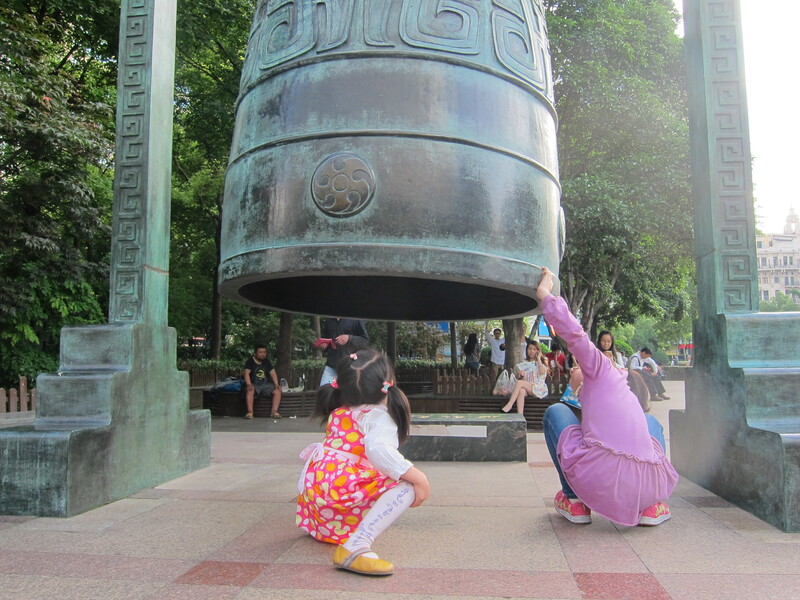 So instead of writing a novel this Sunday, I will just post some nice photos from our first day in town. P.S. 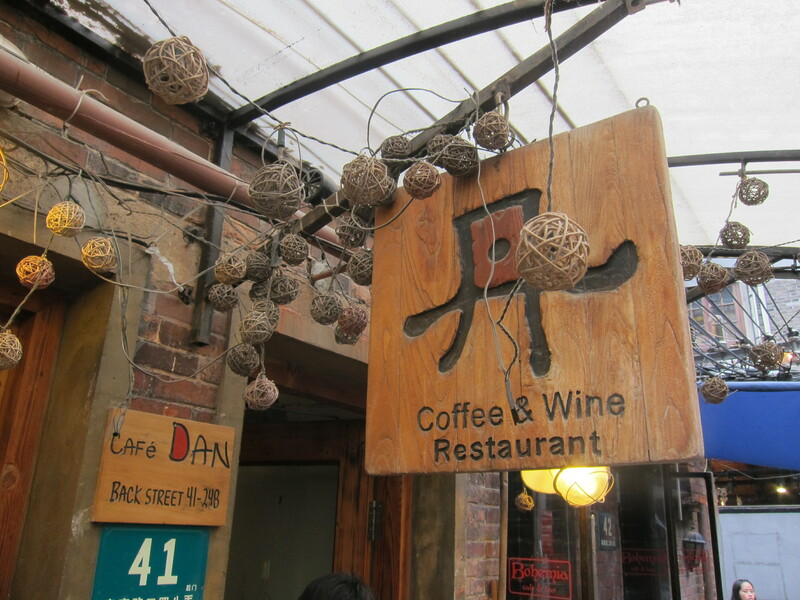 If you thought Shanghai is a poor wine destination, you might want to reconsider. It is Thursday evening as I am sipping this cava. Nothing beats the feeling of an upcoming trip, so it is more than reasonable to start relaxing the evening before a long flight. I have always loved Thursday cava (or any day cava for that matter). 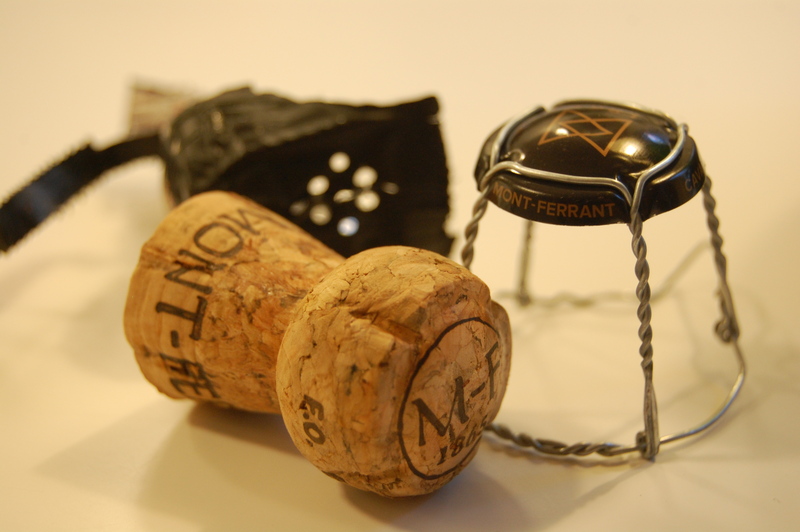 The bottle of Mont-Ferrant Berta Boyzy was bought from a small wine shop in Barcelona. It was one of these gambles, no idea what to expect but the parameters (right grapes, method etc) were there. It is always fun to buy a few wild-cards to have around the house. My collectibles, cork and metal cap. This time, we hit the mark. 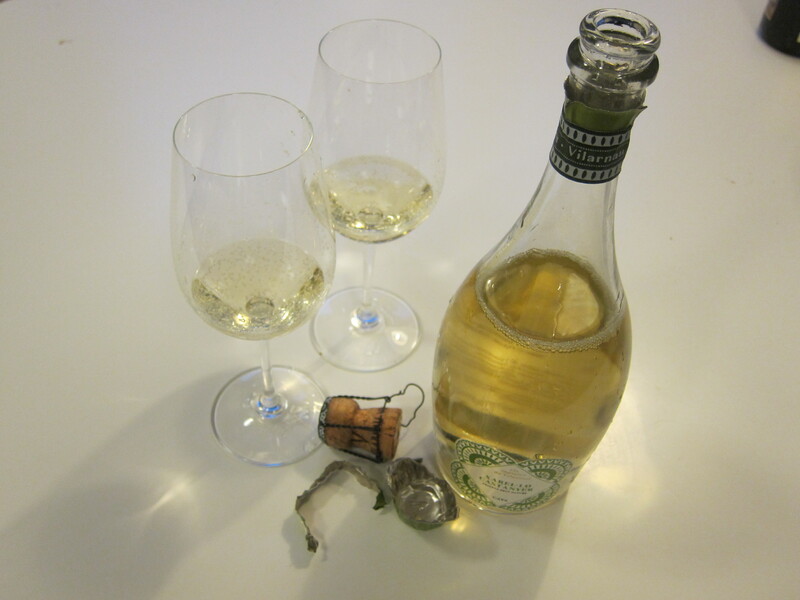 The Berta Bouzy, regardless of being only an entry level cava(~9 months of aging) it is a very positive experience. The nose is slighly sweet of apricot and yellow apples with some granite and lime stone. The taste is more full with light acidity, zesty lemon and baked apples. It is in the top range of entry level cavas I have tasted, so quality-wise I would give it a 3.5. The problem is that I don’t remember what we paid for it, so value for money-wise I cannot rank it (even google was not able to help me on this one). I have earlier mentioned some of my fave wine-accessories, like the Coravin. But one has clearly not received the praise in this blog that it deserves. I received my first Wineboy from my friend Niina as a house-warming gift. I had just moved to London and was unpacking my things as she presented her gift. It was small and elegant and perfect for someone like me who does not mind popping open a bottle every now and then but would not necessarily want to finish it the same day. 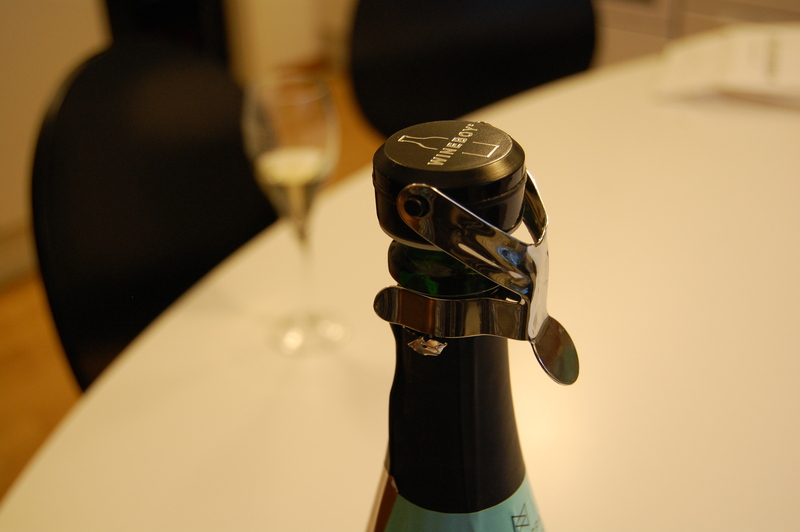 The Wineboy is a temporary cork to salvage your bubbly after it has been opened. 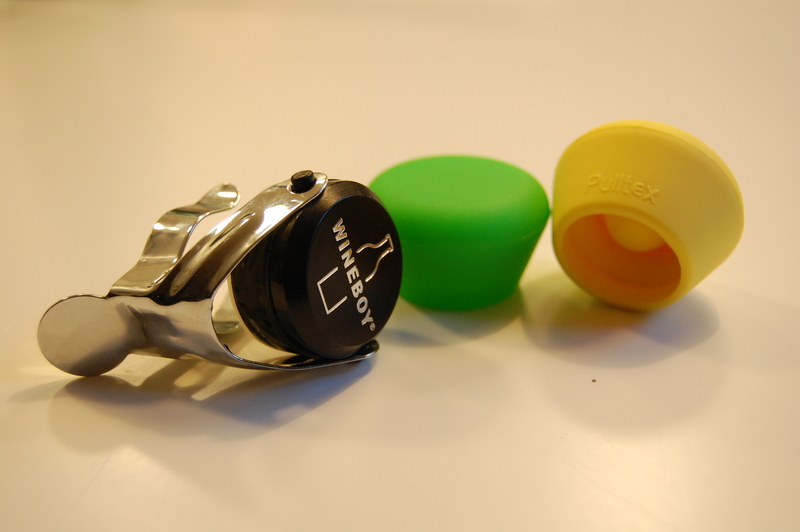 Cool colorful Pulltex corks and the Wineboy. The Wineboy, my first love. Keeping the bubbles since 2012. Since my first encounter with the Wineboy, I have stocked up with several similar corks, the silicone Pulltex being a new pet. A temporary cork is not (nearly) as preserving as the Coravin, but you can’t use that on a bubbly anyway. A Wineboy will at least preserve the wine for consumption the next day, and the Pulltex is said to keep your sparkling fresh and bubbly longer (up to five days – I am doubting it a bit but will try it). One day is usually enough for me, as it is often on Fridays when we pop open a bottle to consume over the weekend. However I am of course intrigued to test if the Pulltex can pull off something better. This is a rather cheap accessory to have around the kitchen, so just in case I have seven. You never know when you feel like opening seven bottles at a time. Just joking, we use them for tastings as well. A pack containing two Pulltex corks costs around 139 SEK in the local monopoly shop and the Wineboy to my recollection was 10 EUR. So this insurance for bubbles is a cheap purchase. Googling a bit I can see that Pulltex do other very cool wine accessories as well, so perhaps I need to get better acquainted with the selection. It was just a small afterwork event. 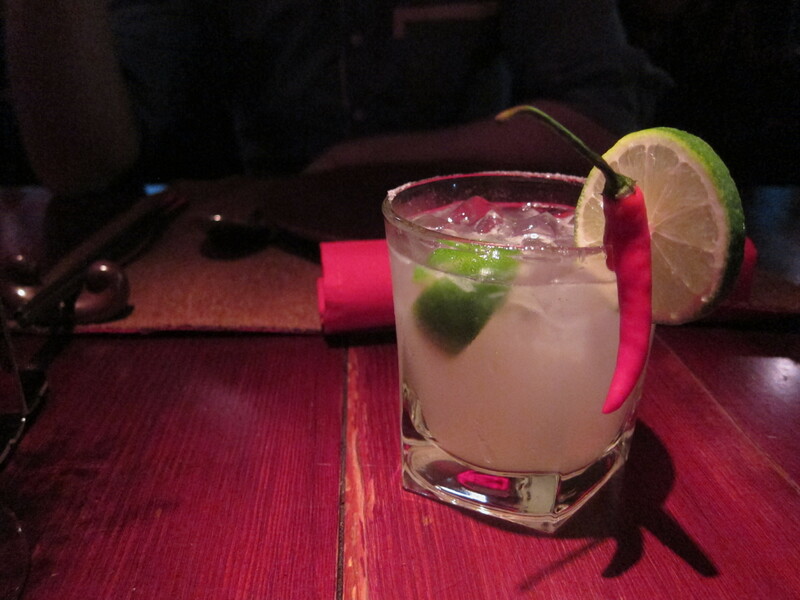 I was on my way to dinner with a friend, when we decided to stop by a Yelp Social for a pre-drink at Magnolia Café. For those of you who do not know Yelp it is a community with online reviews of mainly restaurants, bars etc but also a lot of local business. There is also a lot events being arranged. Agnes, the Yelp Community Manager in Stockholm, told me that this is a place she often comes to sit with the laptop and that they have small tapas and some cava on offer. There is also an art gallery in the other room and they sell some cool T-shirts and other artsy stuff. 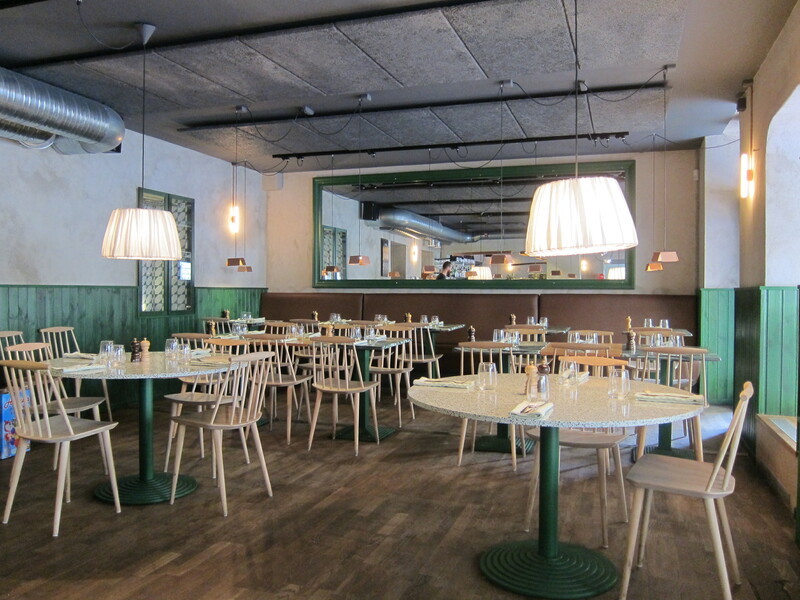 The AW offer was four tapas accompanied by a glass of Jaume Serra Brut Nature cava for 100 SEK (12 Eur). Not bad at all here in Stockholm. The tapas were nothing special but they looked yummy and were made from good ingredients. That is really all you need. There were only three options of tapas, all slices of baguette with toppings. I chose two with chanterelles, one with chopped fresh olives and one with cream cheese. As anticipated the fresh chanterelles were the best. The cava was dry with a hint of minerals. It did not have much complexity and there was this metallic character to it. Nevertheless it was enjoyable as an AW drink with some salty finger food. I would not buy a bottle of it, but the glass was empty pretty fast (so I must have liked it a little bit at least). 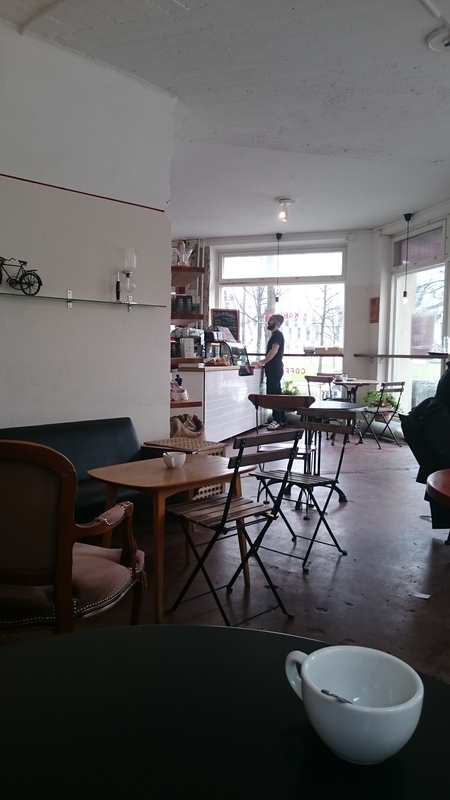 The ambience is pleasant, slightly quirky, and the café is located just off Hornsgatan close to Mariatorget. Its a nice location with not too many tourists finding their way to the side street. The art on the wall gives character and the service is extremely friendly. I highly recommend stopping by for a tapas or two (or four and a glass of cava). During our last trip to Barcelona, we visited Caves de Vilarnau, an interesting sparkling wine producer in the capital of cava, Sant Sadurni (read about visit here). Vilarnau had been on our minds since the last Cavatast and we wanted to sample the full selection. As we toured the cellars our friends at Vilarnau told us about their new products and experiments, one of them being a 100% Xarel.lo wine aged in traditional chestnut barrels. They explained that that chestnut was the way wine was aged in the old days in Catalonia. That already sounded delicious, so my curiosity was on a high, not to mention that the bottle looked inviting to the eye. I think our friends at Vilarnau could see my excitement as we received a bottle as a gift before we departed from the cellar. Last week we finally popped open the bottle of the Vilarnau Castanyer and yes it was indeed delicious. More like a white wine with bubbles, it had charisma and a light chestnut flavor. The nose had some tropical and balsamic notes with a hint of chamomile and custard (even the idea of soft cheese in the scent was thrown around). Creamy and soft on the palate yet fresh. This cava is a beautiful pairing with some traditional Catalonian foods, tomato bread, grilled vegetables and cheeses. This cava is something different. The bottle and the design of the label are beautiful, and the light golden color of the cava fits that really well. I would love to see this wine in our selection (perhaps I someday will). All in all I give it a 4 in quality. Value for money it is difficult to say as it is only sold through Vilarnau’s own sales channel for 14.50 €. I would gladly pay this price and perhaps even more to have it available here in Sweden. 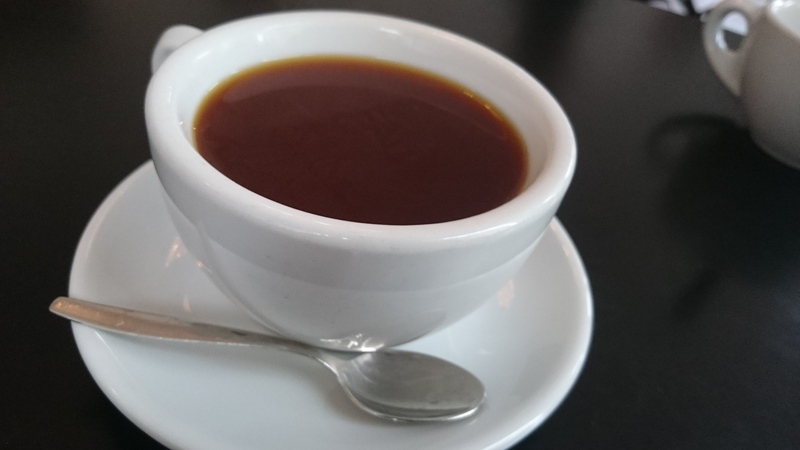 It is Monday again and time for another Coffee Monday and I am continuing a bit on the writing about the Helsinki coffee scene. One of the places I seldom visit but still really like is Kahvila Sävy. The reason for the visits being somewhat infrequent is the location. It is not really city center location as it is in Kallio, and not the part closest to the center. 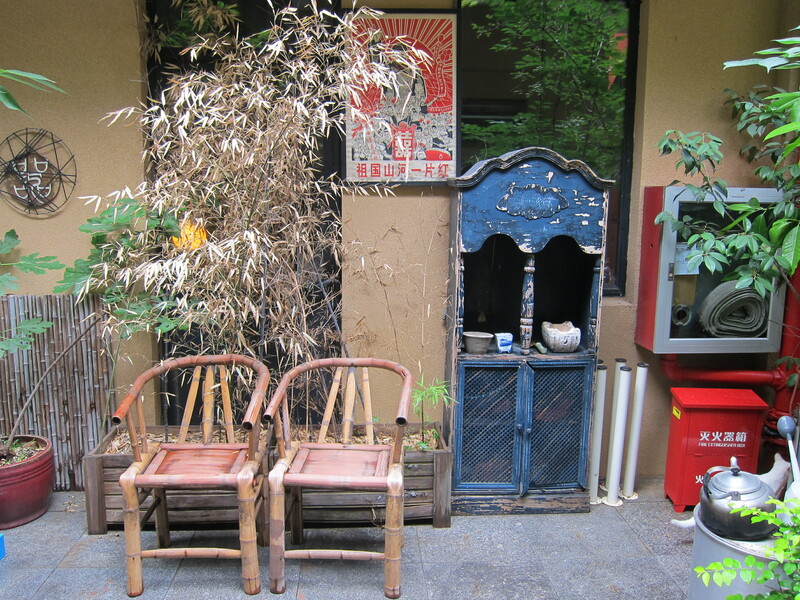 It is a ‘lively’ area with a mix of shady massage places, dive bars and really cool hip cafes and bars. I do think the area as such is worth a visit as it feels much more alive than some other areas. 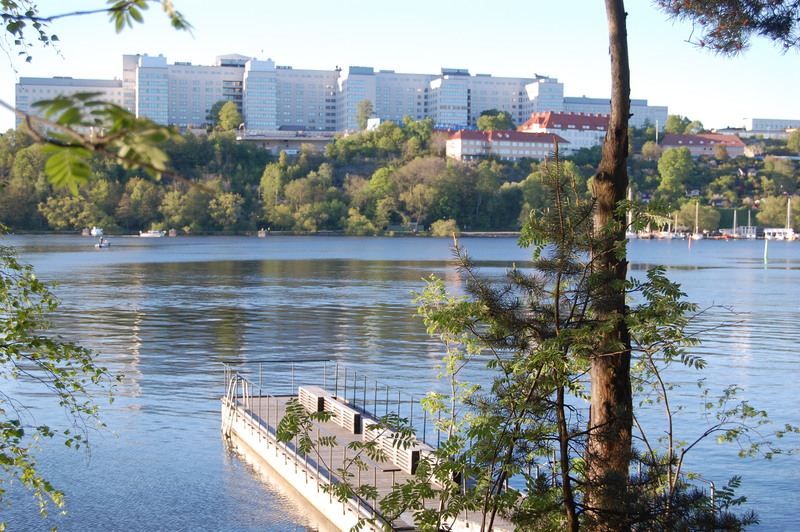 I will also ensure to visit more often as, when I write this, I realize that Sävy are actually really good and one of the places that makes Helsinki a great coffee city. 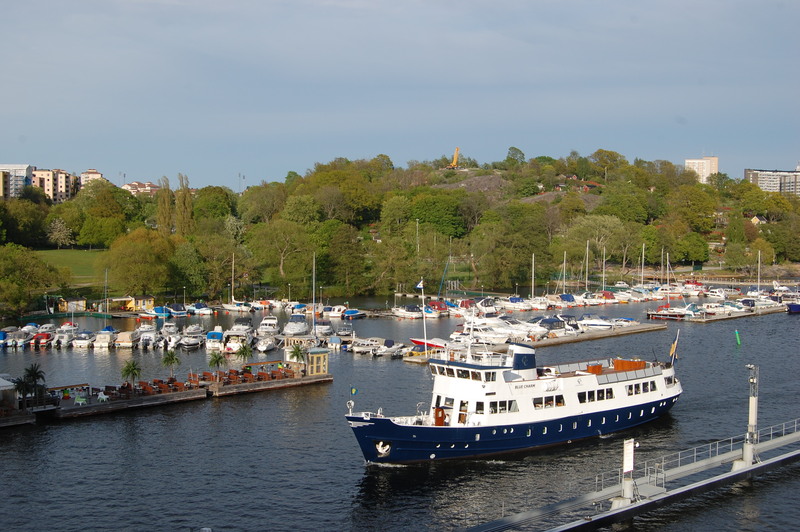 Sävy has been here for a fairly long time but it has changed owners during that time. It is always a cause for concern when places change owners but in the case of Sävy I actually think the coffee quality has benefited from it. They serve a selection of mainly Finnish micro-roasters as well as the occasional other Nordic roaster and there is a range of methods to select from. I have tried pour over, aeropress and espresso based beverages here and the quality is in general very good. Especially the aeropress is usually good. There is a limited selection of some café style food as well and while it may not be the main reason to visit one does not need to go hungry here. I would however still prefer the food in the small sandwich place, Street Gastro, around the corner. They serve some excellent sandwiches so I always pick something up there when in the area. Sävy is a very relaxed place, the décor is a bit shabby and somehow reminds me of how it looked it student cafés I used to frequent when I was younger. Perhaps not really my style of place but it is comfortable to sit there and there is free wifi. Service is friendly but not overly chatty but still good. It is late Sunday evening and I feel like I need a holiday. It was a hectic week with a lot of wine-action and the week of our big tasting. You know this happy feeling when you have completed a marathon, well that’s how I feel right now, exhausted and happy (even though I have never run a marathon so I wouldn’t perhaps know). Thank God, I can go to the office tomorrow to rest (just joking). We have a nice trip coming up, and even though our trips are seldom only holidays, this one will be relaxing. 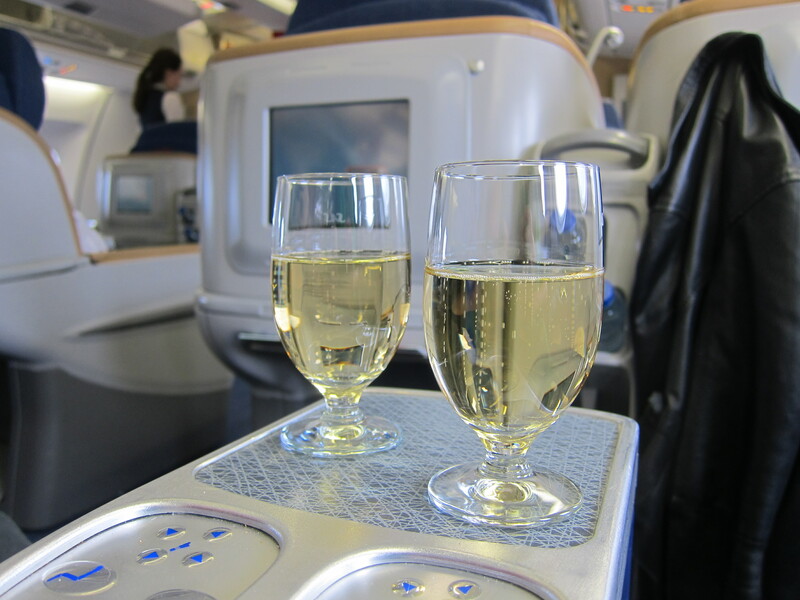 On Friday, me and M head of to Shanghai for five days, travelling comfortably in business class. No, we could not afford to buy such expensive tickets, but we used well earned airline points to score the comfy seats both on the way there and back. I am even looking forward to the flight this time and will be reporting what kind of wines they serve when to the left of the airplane entrance. Back to the big tasting. As we took in 17 new wines from Spain and Portugal to our selection we wanted to give people the chance to come and sample them. Many of our customers know us and our taste, but it requires a special kind of trust (and too much money) to buy a box blind even though you have like minded wine people making the recommendation. We were also very curious about the reception of our new wines. We sell only products that we like ourselves (as then we can drink the rest of our stock if no one buys it), but you never know exactly what is to other peoples liking. So we invited around 30-50 of our friends and customers to a free open house event around the area where we live in. We rented a small space with a kitchen and a bathroom in a residential building close by and turned it into a tasting room. Nothing fancy but we had a counter and tables where people could sit and make notes. We had procured some small spit buckets, a champagne cooler fitting 4-5 bottles and stoppers (temporary corks); printed out some price lists and information sheets and M had spent the week making ice. We had also bought some more tasting glasses from Ikea (as starting entrepreneurs we cannot afford Riedels), so we were all geared up for the event. All the setting up took so much time though that we had to compromise a little bit on the look of things and did not have that much time to really think of structure. So there are a few things we will most probably do differently the next time, like having some note-sheets so people remember which wines they have tasted and what is next on the line. Our good memories served us well, but the bigger these events get, the more difficult it is to stay on track. The event was a huge success. We had over 30 visitors during the day and already sold out of some of the wines. I am not sure if this tells more about the success of the event or our poor skills for estimating what will actually sell, as the rose wine from Quinta do Saes was out of stock half way through the day. All in all our selection was well received and we actually sold quite a lot already at the event. We still have a few weeks to go before the wines are shipped, so this might be our most successful month yet (that’s probably good as our stock levels increased a bit with all the new suppliers). This week I have also tried out a new camera. Actually an old camera, our Nikon D40, but I seldom use it due to its size. The pictures you see in this post are the trial pictures I have been taking during our evening walks. It is a green and light time of the year, so great for taking photos. I am an amateur with a big A and do not see myself putting much more effort into Photoshop, but I do like the depth that a real camera gives t the pictures. Let’s see what comes out of this. I also acquired a tripod and some reflectors and with those I am hoping to improve the pictures I take of wine. 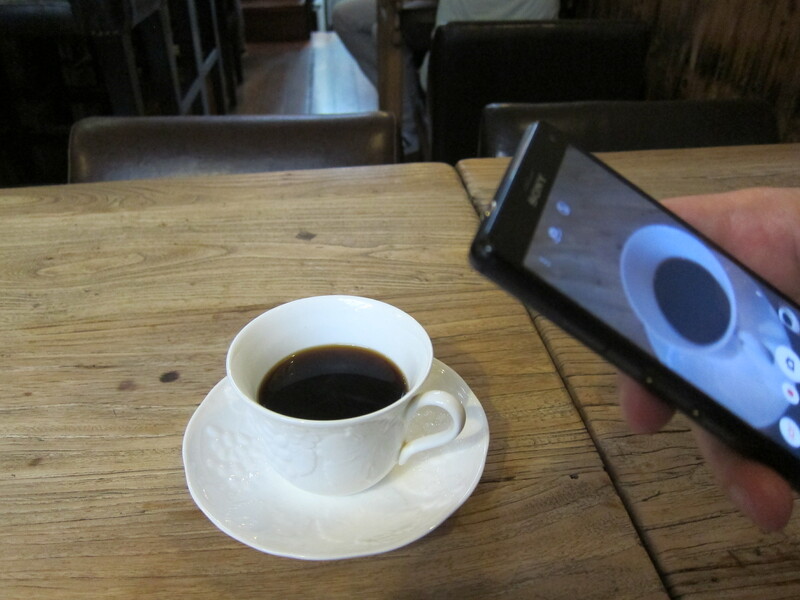 Personally I like nice photos in a blog, but M says it disturbs the readability. I don’t know, what do you think? That was it for this weeks Sunday chat. New week will be hard hard work and then on Friday a well earned full night sleep on the plain to Shanghai. We also have a fridge full of opened bottles from the tasting, so I am 99.9% sure there will also be wine. 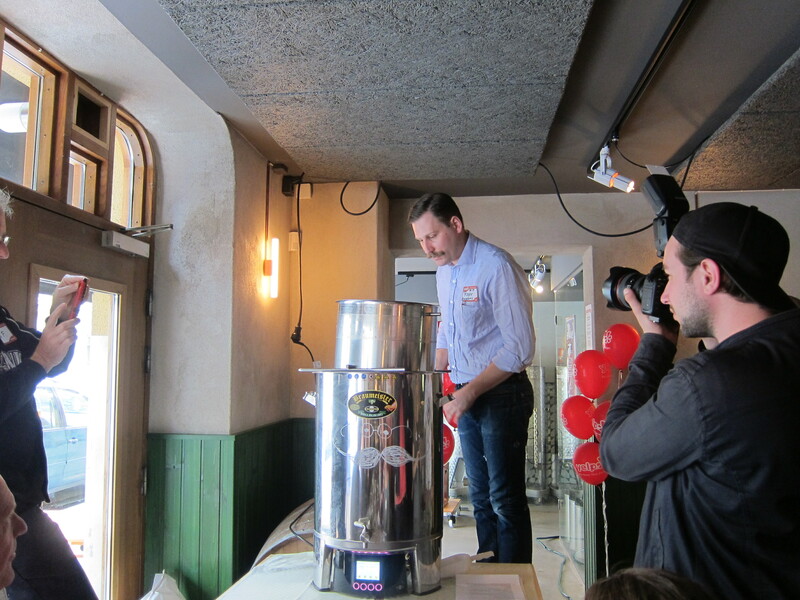 Last week, myself and M attended a beer brewing course arranged by our friends at Yelp Sweden. I am always intrigued about the making of things, a supply chain specialist as I am, so we were quite excited about the event. 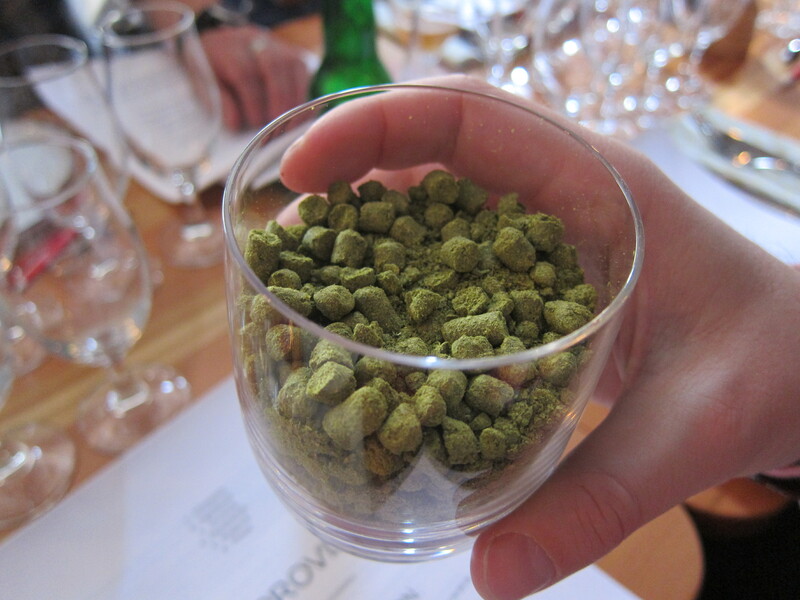 The course was arranged at a small brewery and pub, Cafe Proviant in Stockholms Kungsholmen. 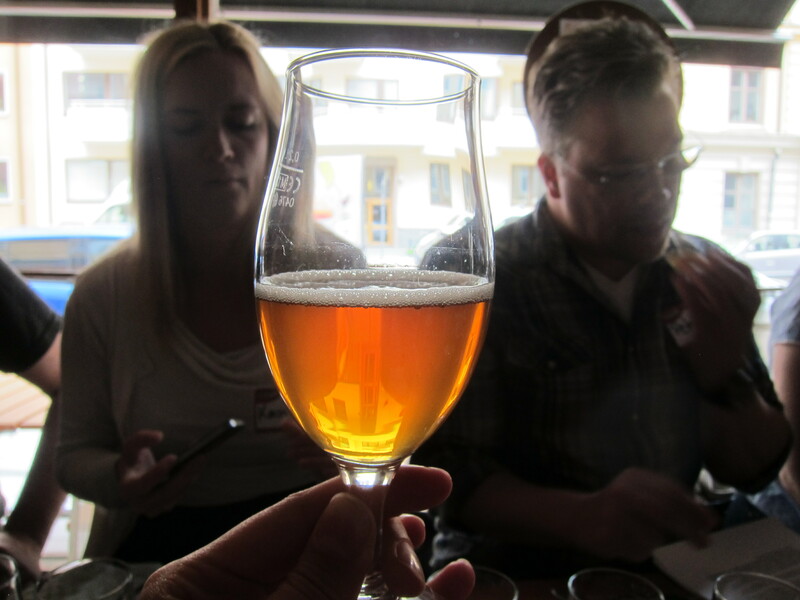 It is difficult to write about beer brewing in a short way, so this will more be a description of our day on the course instead of a manual on how to make beer (for that you need to attend Cafe Proviants course). I was not sure what to expect from the course. Would we be brewing ourselves or would it be more like a lecture? It was closer to the latter, as we sat around a big table following closely as the brew-master, Roger, guided us through every step. He started with introduction of the art of brewing and the ingredients. 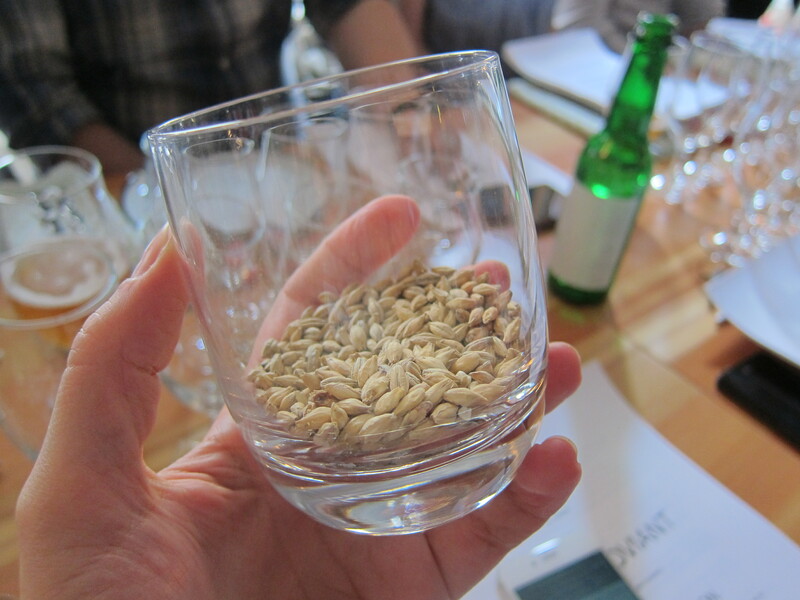 Glasses of sample ingredients were circulated around the table followed by the mixing of malted barley with the 68 degree (C) hot water. The first tasters of Cafe Proviant Ale were served as Roger shoveled the ingredients into the boiling pot. After the first steps we had some waiting time (approximately 90 minutes). The staff kept us entertained with some more sampling of beer and tasters from their menu. 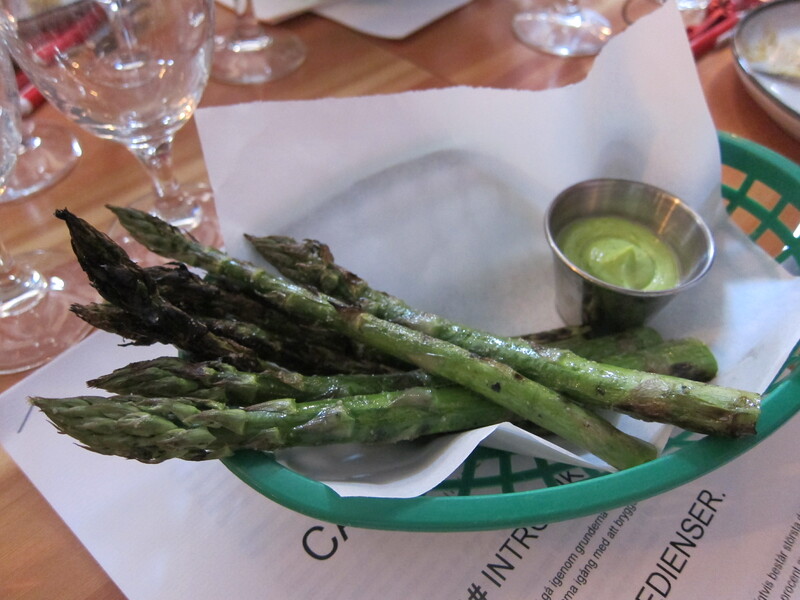 We had cheeses with some sea buckthorn chutney, a soft pretzel with ramson butter and grilled green asparagus with a few different sauces. All wonderful dishes alongside beer. Especially the ramson butter has stayed with me as one of the days favorites. Time just flew by as Roger told stories of beer brewing while waiting and circulating the beer in the pot. 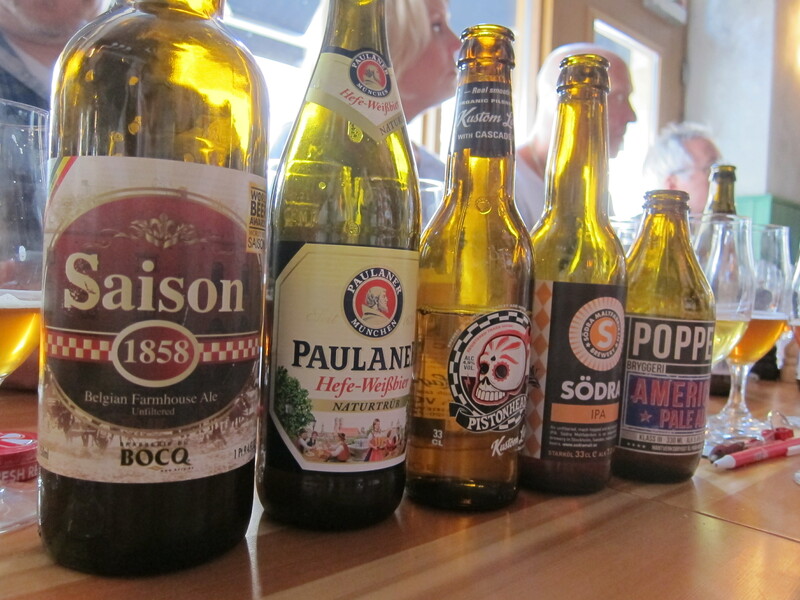 More beer was served as tasters: Pistonhead cascade lager, Poppel American Pale Ale, Södra Maltfabrikens IPA, Paulander Hefe-Weissbier and Saison 1858 Brasserie du Bocq. A wonderful range of Cafe Proviant favorites. My favorite, or perhaps the biggest positive surprise was the fresh Saison. Perhaps I will not down a bottle of it (as the bottle is a 0.75l), but it is a wonderful option to have on the table instead of wine on a hot summer day. After some more cooking more ingredients, the hops are added to the mix. As the heat builds up there is a wonderful aroma of rye bread taking over the room. It reminds me of the Finnish sauna when mixing some beer with the water (old Finnish tradition). We waited, tasted some more beer until the cooking reached a 100C. Meanwhile Roger kept the stew circulating and guarded that no ingredients were clumping up. Beer brewing is a time consuming exercise, so we did not have time to finish all the initial steps before we ran out of time. I can see M eyeing the equipment and sizing it whether it would fit into our apartment. If we would have a bigger home I would also be delighted to have one. However, right now, we both figure that it is better to buy our beer instead of making it. In around four weeks time we can return to Cafe Proviant and try out the beer “we made”. A fun two hours with interesting information, great people and a reason to come back again. For all you beer enthusiasts out there, Cafe Proviant is definitely a place to visit. Earlier this week I started a series of posts that are on the best cavas available in different price ranges. The first part of that series, the entry level, up to 130 SEK (approx.. €14) can be found here. The next level is from 131 SEK to 200 SEK (€14 to €22) and it is sort of a mid-range. To recap for those who did not read the first part this will not cover cava sold anywhere but rather available to consumers in Sweden and Finland. In this area I will be recommending a lot of cavas that we are ourselves selling but there is a pretty good explanation for it as well. One of the main reasons we even started selling cava was the lack of high quality options in general but in this price range specifically. While it is slightly better today, especially in Sweden, it is still pretty limited offering for the person who wants to buy from Systembolaget or Alko and especially if you do not want to order it in advance. In our round-up in the mid-range we are actually not really recommending anything from Alko but for those who are interested both Llagrima D’or and Peret Fuster Rosé cava can be bought in Finland. It is a bit disappointing to see that Alko are not including some more high quality options in the mid range. I would for example like to see the cavas from Vilarnau being made available there (as they offer the basic Vilarnau it should not be that difficult to also have some of their other cavas). There are also a few good cavas (for example some from Castell d’Age) missing from the list below as these have been out of stock for such a long time that they cannot really be seen as available. In general this price range provides a lot of value for money. To me all of the cavas listed here are usually much better options than going for a ‘cheap’ champagne. All of these cavas are excellent quality and while some of these are a bit over-priced in the Nordic countries I would still be inclined to say that these are some of the best value for money one can find in sparkling wine in Sweden (and Finland). All of these are also at least Reserva cavas (so aged at least 15 months) and a few also Gran Reservas (aged for at least 30 months). For clarity I wish to mention that I in this post, as well as the previous one in the series, list the cavas in alphabetical order. Augusti Torelló Mata Reserva Brut from Augusti Torelló Mata: 154 SEK at Systembolaget. This may be one of the basic cuvées from Agusti Torelló Mata but they are a solid house and this cuvee shows that they know their stuff. The cava is light straw color with small persistent bubbles. The aromas are a mix of apple, toastiness with hints of mineral and herbs. The taste is fruity ripe apples with nice acidity. Gramona Imperal Gran Reserva from Gramona: 199 SEK from Systembolaget. Gramona has grown to be one of the fairly big producers of Cava and while not the size of some of the bohemoths it is still readily available in many places. It is in general not my number one producer but they do make very solid cavas and I am happy that it is often available in restaurants. This is their Gran Reserva and it is a nice blend of Xarel·lo (50%), Macabeo (40%), Chardonnay (10%). Aged for three to four years. This has notes of citrus, mineral and apple. Nice nose of toast and apples. Works well with jamón iberico and other dried cured meats. A good cava but a bit overpriced (should more be around 150-175 SEK). Guillem Carol Gran Reserva Brut Nature from Cellers Carol Valles: 175 SEK at thewinecurious. This is one of the Gran Reservas from small family producer Cellers Carol Valles. It is made from Parellada (40%), Xarel-lo (40%) and Chardonnay (20%). This is without dosage but they also makes one cuvée with the same grapes and a small dosage . For me the zero dosage one is however the best one (for those who want a touch more of sweetness, still very little, the extra brut may be better). 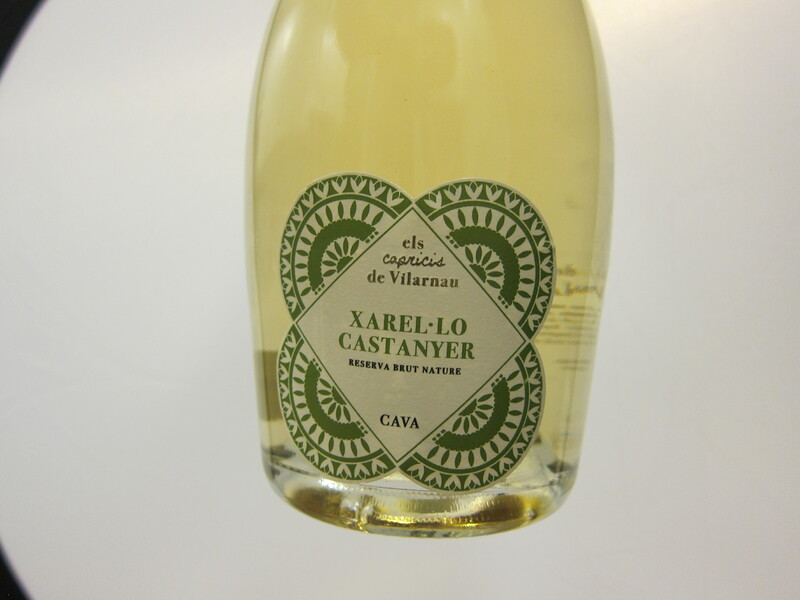 This cava is golden straw colored with fine and persistent bubbles. Soft notes of aging and reduction, fine bakery, yeast and notes of citrus and white flowers. Fresh and creamy on the palate, with excellent acidity and long finish. Llagrima D’or Brut Nature Cava from Llagrima D’or: 175 SEK from thewinecurious. Made from the traditional cava grapes and with no dosage this lovely cava is one of my old favorites. It has pleasant acidity and mineral in the flavor. Some nice toastiness and roundness adds complexity, all in all a lovely cava. 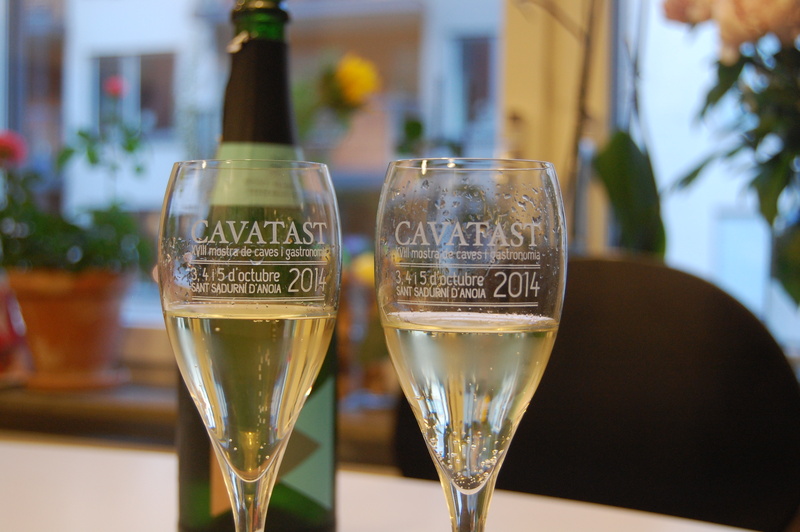 Olivia Brut Nature Reserva from Castell d’Age: 171 SEK at Systembolaget. A lovely 100% Chardonnay cava that has been aged for around 20 months. Very fine and delicate bubbles and the color is bright golden. The chardonnay gives this more of champagne feeling so the nose has a mix of brioche, dried fried and nuts as well as freshness to it. The taste has nice mineral mixed with some yellow fruit. 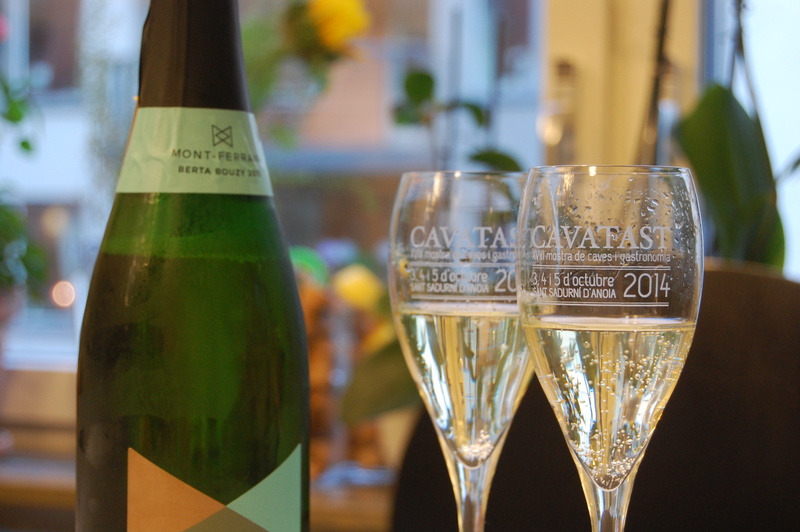 Peret Fuster Rosé Cava from Peret Fuster: 183 SEK from thewinecurious I am not usually a huge fan of rosé cavas but this 100% Trepat is lovely. It has a very small dosage but is still very dry and has lovely red berry flavor. Perfect as an aperitif. Recaredo Brut Nature Gran Reserva 2008 from Recaredo : 189 SEK at Systembolaget.. Blend of 46% Xarel·lo, 40% Macabeo and 14% Parellada. Recaredo were among the first to start with craft production of cava and they are still among the best producers. Aroma of yellow apples, brioche, nougat and hints of orange. The flavor is dry fresh with toastiness, hints of yeast and yellow apples and orange and pleasant acidity. A good cava from one of the top producers in Spain. Rimarts Brut Reserva 18 from Rimarts: 167 SEK from thewinecurious. It is made from a blend of Xarel·lo, Macabeo and Parellada this entry level cava has been aged between 18 and 25 months. It has a bright lemon color. Mid-sized bubbles, elegant and lasting. Strong aroma, fresh and flowery. Full in the mouth, creamy, a touch of fresh sweetness with a good balance between sugar and acidity. It is ideal an aperitif but can also be enjoyed with a variety of dishes. Rimarts Brut Reserva 24 from Rimarts: 175 SEK from thewinecurious. This Brut Nature cava is made from Xarel·lo, Macabeu and Parellada and has been aged between 25-30 months. It is dry with less than 2g/l of residual sugar. Golden yellow color. Small, persistent bubbles. Complex with a nice intensity. Intense aroma of ageing, ripe fruits, toasted grassy notes. Nice mouth-feel, well-structured with a long, enjoyable finish. 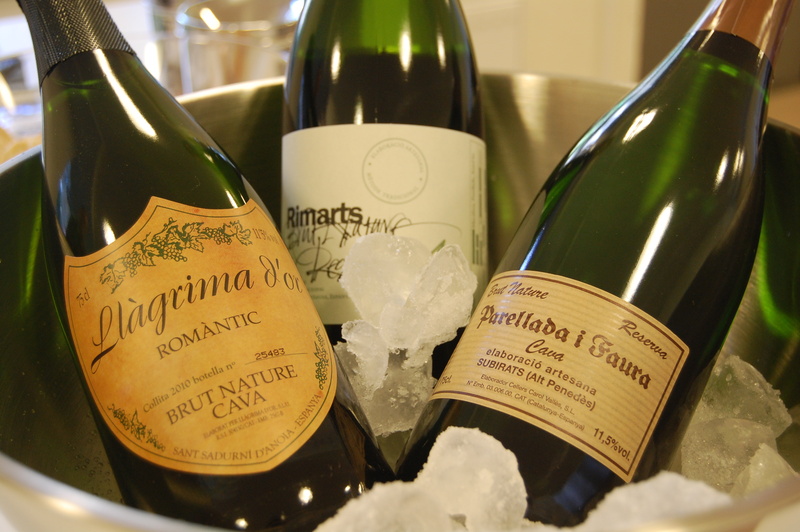 Rimarts Brut Nature Gran Reserva 40 from Rimarts: 200 SEK from thewinecurios. In addition to the traditional grapes Xarel-lo, Macaveo and Parellada this cava also contains Chardonnay. It has been aged between 36 and 42 months and this produces an amazing result. It has bright gold color with very fine, persistent bubbles. Aromas of ripened fruit, notes of ageing, toasted nuts mix with hints of yeast and brioche. Perfectly balanced with a long and pleasant finish. It is one of these cavas that makes you understand why the Catalans enjoy sparkling wine not only on its own but also with bbq, stews and all types of food. In this category there are many fine cavas but if I would select my favorite one it is fairly easy. The Rimarts Gran Reserva is one of my all-time favorite cavas and is then my choice. That said all of the cavas presented here are really good so if you find them somewhere there is no need to hesitate just try it. Stay tuned for the third part in the series coming soon. There we will be presenting some of the more high end cavas available.